Odds are you know what mold is–or, at the very least, you have an idea of what mold is and have certainly seen it. However, black mold might be something that you don’t know as much about. 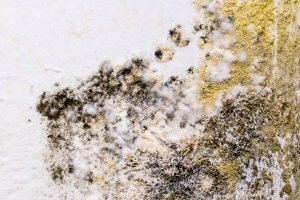 There tend to be a lot of misconceptions about black mold. People often think it’s a much more dangerous version of regular mold and that it’s toxic to breathe in. The following is a brief breakdown of everything you should know about black mold. Black mold is generally not toxic. In fact, there’s not much difference between black mold and “regular” mold. The color of the mold will tell you nothing about it since there are over 100,000 species of mold. It’s impossible to tell what kind of mold you have just because its black — it has to be tested. That’s not to say that there aren’t any toxic molds. Some molds are toxic, but their color has nothing to do with it. For example, some strains of mold can produce respiratory and neurological symptoms. Can you remove black mold yourself? First of all, any type of mold growing in your home could potentially be toxic, even though odds are that it’s not. Because of this, you should always take extra precautions by leaving your mold problem to a mold remediation company. Even though it’s probably not toxic, you might think that black mold is something that you can just get rid of yourself. After all, if you take a rag and wipe it across a surface that has black mold growing on it, it will often wipe right off–especially if it’s on a tile surface, such as in a bathroom; however, you should strongly consider getting a professional mold remediation service to come in and do a thorough inspection of the area in which the black mold is growing. The reason for this is simple–simply wiping away the black mold that is visible does not mean that you’ve gotten rid of it all. There may be black mold growing in other places that you cannot see. If will just continue to spread, potentially causing damage to your home as a result. A mold remediation service will not only completely remove all black mold, they will track it down to its source and take steps to ensure that it won’t return. How can you prevent the growth of black mold? Maintain proper humidity levels – Too much moisture in the air will help promote the growth of mold. Your humidity levels should be less than 50 percent. If it’s above this level, you should consider getting a dehumidifier. Be sure to pay careful attention to your humidity levels in the summers, when it tends to be more humid. Ensure proper ventilation – Good ventilation will help remove moisture from the air. Make sure areas like the bathroom and kitchen are properly ventilated. Avoid using rugs in areas with moisture – Try not to use rugs in the kitchen or bathroom areas since they tend to attract mold growth when subjected to excessive exposure to moisture. Black mold may not be toxic, but that doesn’t mean that you can handle it on your own. If you think you have a black mold problem in your home, make sure that you contact a professional mold remediation service.